Emergency response exercise drills will be taking place at Ellison Onizuka Kona International Airport in Keahole on Thursday, Nov. 16, 2017, as the airport will serve as the staging area for the Triennial Aircraft Disaster Exercise. The exercise is a mandatory certification requirement by the Federal Aviation Administration, which tests airfield disaster preparedness and response by simulating a full-scale aircraft emergency disaster. The exercise tests and evaluates the operational capacity of emergency response in a stress environment. The multi-agency exercise from 8 a.m. to noon will utilize student and teacher volunteers from the West Hawaiʻi Explorations Academy who will act as injured passengers. Participating agencies include the Hawaiʻi Department of Transportation (HDOT) Airports Division staff, HDOT Aircraft Rescue Fire Fighting units, Securitas, FAA, Transportation Security Administration, Hawaiʻi County Civil Defense, Hawaiʻi County Fire and Police Departments, Emergency Medical Services, Kona Community Hospital, American Red Cross, University of the Nations Kona Community Emergency Response Teams (CERT), American Medical Response, U.S. Army Garrison-Hawaiʻi Pohakuloa Training Area, Hawaiʻi Air National Guard 154th Wing, United Airlines and other airline personnel. Flight operations will continue as normal during the exercise with no impact to scheduled flights. 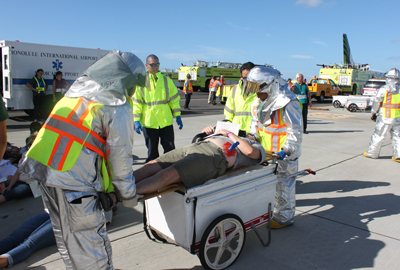 HDOT alerts the public there will be realistic scenarios portraying injured people on the airport property and may include fire, fire suppression, rescue, triage, treatment and transportation using emergency response vehicles. This is a drill and not a real-life emergency.